Great Cartoon Character Or The Greatest Cartoon Character? That's one hell of a Saturday morning. 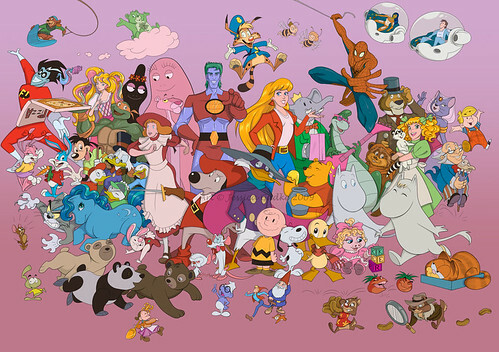 Jessica Gädke's tribute to a selection of her childhood heroes easily dates her as mostly a 1990s cartoon watcher, especially as she decided to leave out classic Warner Bros. and Disney characters. Hopefully she'll do one of those as well. Though most of these cartoons happened well after my traditional 'toon-watching time, I'm familiar with most of them due to younger sisters and an exceedingly lazy trip though university. A few earlier characters have slipped through, notably the Barbapapas, Charlie Brown and Snoopy, and Tom and Jerry. My nostalgic fave from the bunch is Pinky and the Brain. The Brain: "The same thing we do every night, Pinky — try to take over the world." If It Weren't For You Meddling Kids! Why is it the Barbapapas are always making eyes at each other? No wonder they had so many bowling-pin offspring. What I want to know is what's with the hairy one? Did Barbamama do a Clickety Click—Barba Trick? Hmmm, I'd say the artist seems to have been doing most of her watching in the late 80s - early 90s. I can ID probably 90% of the shows referenced there, although my cartoon viewing goes back to the mid 80s, factoring in the older Hanna-Barbera reruns of course. FOBulosity - Don't Be Dull, Be Dazzling! You Say Kaese, I Say Kaufmann!